With over $500 billion worth of merchandise sold to international markets annually, goods exports contribute considerably to Canadian economic activity. This reliance on foreign markets comes with risks arising out of volatile commodity prices, exchange rate fluctuations, changes in demand for commodities, as well as economic and political uncertainty. Export diversification can be thought of as a way to reduce risk by spreading it among various products and markets. Two types of diversification, namely product and geographic diversification, apply to international trade exports. Product diversification means spreading exports across a wide range of products as a way of hedging the risk associated with commodity price volatility, as well as downturns in the global demand for specific commodities. Geographic diversification can be applied to markets of destination and provinces of production. Diversification of destination markets means spreading exports across a number of partner countries as a way of hedging against exchange rate volatility and political or economic risk specific to a particular export market. Diversification by provinces of production involves the participation of a number of provinces and territories in the export of goods, with the safeguard of spreading among provinces the various risks associated with reliance upon foreign markets. As an inverse measure of Canadian export diversification, a concentration ratio, based on the Herfindahl-Hirschman index (HHI), is now available. Values of this ratio range between 0 and 1, with values close to 0 representing greater diversification of exports and a value of 1 representing perfect concentration of exports. Exports can be considered diversified when HHI levels are below 0.15. Concentrated exports can be further separated into sub-categories for moderate concentration (0.15 <= HHI < 0.25), and high concentration (HHI >= 0.25). An index of the concentration ratio is also available, facilitating the analysis of Canadian export concentration levels over time. Furthermore, product diversification can also be analyzed at the provincial and territorial levels. In terms of product diversification, Canadian exports were consistently diversified throughout the period of study. The degree of product diversification has increased in recent years with the decrease in crude oil exports. 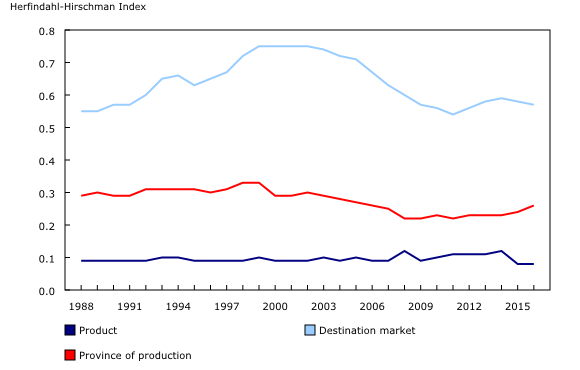 In 2016, Canada's HHI for product diversification was 0.08. Export diversification by market of destination is characterized by a high level of concentration throughout the period of study, with the United States being the dominant market for Canadian exports. The HHI for Canadian diversification by market of destination was 0.57 in 2016. Among non-US countries, Canadian exports are diversified by market of destination. Diversification by province of production has moved between moderate and high concentration throughout the period of study. In 2016, the level of the HHI was 0.26, with exports concentrated in Ontario. All of the information presented in this paper is on a customs basis. Customs-based merchandise export data aim to capture the outgoing movement of merchandise across the Canadian border. For customs-basis exports, the final destination known to the company in Canada that is exporting a good determines the trading partner. Export data aggregation is done at the Chapters level (Chapters 01 through 97) of the Harmonized Description and Coding System. The data cover the period from 1988 to 2016 and will be updated annually. The data for this paper were drawn from the new CANSIM table 228-0082, which contains annual data on Canadian export diversification. The infographic "Export Diversification" (Catalogue number11-627-M) is now available. The document, "Measuring Canadian export diversification", which is part of Latest Developments in the Canadian Economic Accounts (Catalogue number13-605-X), is now available. To enquire about the concepts, methods or data quality of this release, contact Sandra Mutimukeye (613-790-3504; sandra.mutimukeye@canada.ca), or Chris Maloney (613-790-7158; chris.maloney@canada.ca), International Accounts and Trade Division.